Kothu Parotta A.K.A Paratha is a traditional item popular in South India especially in Tamil Nadu. Chilli Kothu Parotta or Paratha ( പൊറോട്ട ) is basically orginated in Sri Lanka as Kothu Roti. 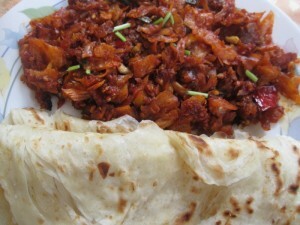 Kothu Roti is prepared by using parotta, egg, meat, and Salna ( a spicy sause ). This is a spicy dish without egg & can enjoy with the friends and family members. This is simple and easy to make. Try this spicy dish in your kitchen and enjoy! Tear the parottas into bite sized pieces or alternately cut them into strips using a knife. Heat a pan, and add oil and once its hot, add the chopped garlic and saute for a few seconds. Add the minced ginger, green chilies and onions and saute for 3 minutes. Add red chili powder, garam masala powder, soy sauce, tomato sauce and salt to taste and mix well. Add the shredded parotta and stir well. Finally add the lemon juice and mix well. Turn off flame. Tasty Chilly Kothu Parotta is ready and garnish with coriander leaves.